For years, the 33,000 residents of Lawndale, California, were served by only one city park. But in April 2012 The Trust for Public Land secured state funding to build a park on a 1.5 acre vacant City-owned lot and worked with the community to develop the design. Opened in May 2016 the park is named for Larry Rudolph, a Lawndale city councilmember who passed away shortly before it was completed. The new park features a community gathering space with shade areas, picnic tables, an amphitheater, and restrooms. The large playground is cut by an artificial stream decorated with hand-made mosaics, which flows into a sand pit featuring a climbing structure and whimsical umbrella shade structures. Other play elements for all ages include climbing nets and an embankment slide. Park visitors can get fit in a Trust for Public Land Fitness Zone® exercise area along the perimeter walking path, or they can survey the entire park from atop a viewing deck. 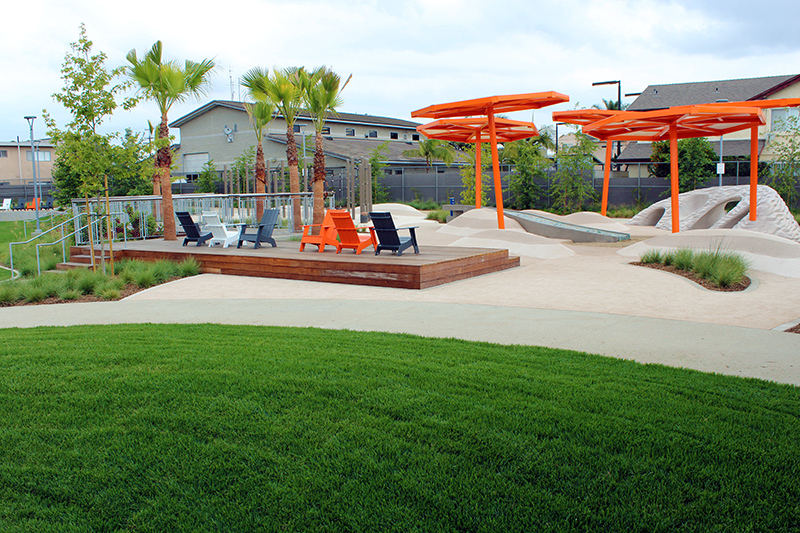 Additional features include a grassy lawn, a climbing wall with mosaic perching nooks, native and drought-tolerant landscaping, and screens between the park and surrounding residences. This project was made possible through strong partnerships with the City of Lawndale and From Lot to Spot, a Los Angeles-based nonprofit. Project funding was provided by California State Parks Statewide Park program and generous private support from Edison International, Kaiser Permanente, the Max Factor Family Foundation, the Ralph M. Parsons Foundation, and the Rosalinde & Arthur Gilbert Foundation.